So, I don’t actually have a story to about why Pumpkin Center is called Pumpkin Center, but I do have some interesting, random, Pumpkin Center facts. 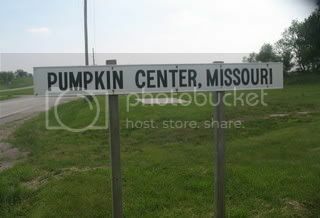 I was looking for information on Pumpkin Center, MO, (where Kay Barnes‘ mother was born), to continue the Missouri theme, and found that since the highway was put in there isn’t much left of that town, except for maybe a couple of buildings and a photo by the road. However, while looking for Pumpkin Center information, I discovered that there are no less than 23 towns called Pumpkin Center in the USA. There are Pumpkin Centers in Alabama, Arizona, California, Florida, Indiana, Kentucky, Louisiana, Maryland, Mississippi, Missouri, North Carolina, Oklahoma, South Dakota, Tennessee, Virginia. Some states, such as Oklahoma, have several towns called Pumpkin Center. Also, in Colorado there’s a town called Punkin Center, Population 9. So, if anyone knows why there are so many places called Pumpkin Center, or has a story about why any of the Pumpkin Centers is called Pumpkin Center, I would love to hear them. Gee, I remember punkin center MO. My grandparents lived on a farm a few miles west of there. This would be in the 1950s and 60s. I remember the old store with a wooden screen door and the Rainbow Bread sign and there was always a fireworks stand by the parking area. Didn’t know Kay Barnes mother was from there! I still have family in nearby Barnard MO. My grandparents had a farm near Pumpkin Center, MO; my grandfather would take me for 1 cent candy at the gas station there. They always had the best pumpkins, gords, Fall stuff for sale. I miss those times…..what have we lost….. Please email me with your memories; we are all one family. At least some, if not all, are probably named after the fictional town in stories by an early 20th century comedian that were recorded and sold on records. It was rather like a Lake Woebegon of the period. The recordings sometimes show up on ebay. My Grandmother, Mary Hagen, told me she lived in Pumpkin Center when she was a little girl. That would have been in the early 1900’s. It was near Bell City in Stoddard County, Missouri.